Amorphous metals have low toughness, but high strength. An amorphous solid is a solid in which there is no long-range order or repeating pattern in the positions of its atoms or molecules. On the other hand, if there is long-range atomic order, the solid is described as crystalline or morphous. 1.2 Preparation of "metallic glass"
Most classes of solid materials can be found or prepared in an amorphous form. Examples of amorphous solids include window glass, many polymers (such as polystyrene), and the silicon in many thin-film solar cells. Even foods such as cotton candy are amorphous solids. An amorphous material is often prepared by cooling its molten state rapidly. The cooling reduces the mobility of the material's atoms and molecules before they can pack into a thermodynamically more favorable crystalline state. Amorphous materials can also be produced by additives that interfere with the ability of the primary constituent to crystallize. For example, the addition of sodium carbonate (soda) to silicon dioxide results in window glass, and the addition of glycols to water results in a vitrified solid. Some materials, such as metals, are difficult to prepare in an amorphous state. Unless a material has a high melting temperature (as ceramics do) or a low crystallization energy (as polymers tend to), cooling must be done extremely rapidly. A glass may be defined as an amorphous solid that is usually produced by mixing silica (silicon dioxide) with other chemicals at high heat, and allowing the mixture to cool without forming a crystalline structure. Ordinary, soda-lime glass, used for windows and drinking containers, is created by adding soda and lime (calcium oxide) to silicon dioxide. Without these additives, silicon dioxide will (with slow cooling) form quartz crystals, not glass. Some amorphous metallic alloys can be prepared under special processing conditions, such as rapid solidification, thin-film deposition, or ion implantation. The term "metallic glass" refers only to amorphous metallic alloys that have been rapidly solidified. 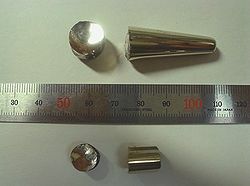 Materials produced by ion implantation or thin-film deposition are technically not called metallic glasses. Even with special equipment, such rapid cooling is required that, for most metals, only a thin wire or ribbon can be made amorphous. This is adequate for many magnetic applications, but thicker sections are required for most structural applications such as scalpel blades, golf clubs, and cases for consumer electronics. Many different solid phases are present in the equilibrium solid, so that any potential crystal will find that most of the nearby atoms are of the wrong type to join in crystallization. The composition is near a deep eutectic, so that low melting temperatures can be achieved without sacrificing the slow diffusion and high liquid viscosity found in alloys with high-melting pure components. Atoms with a wide variety of sizes are present, so that "wrong-sized" atoms interfere with the crystallization process by binding to atom clusters as they form. One such alloy is the commercial "Liquidmetal," which can be cast in amorphous sections up to an inch thick. One way to produce a material without an ordered structure is to take a crystalline material and remove its internal order by damaging it. A practical, controllable way to do this is by firing ions into the material at high speed, so that collisions inside the material knock all atoms from their original positions. This technique is known as ion implantation. It produces amorphous solids only if the material is too cold for atoms to diffuse back to their original positions as the process continues. Techniques such as sputtering and chemical vapor deposition can be used to deposit a thin film of material onto a surface. If the surface is kept cold enough, the atoms being deposited will not, on average, have enough energy to diffuse along the surface and form ordered crystals. For every deposition technique, there is a substrate temperature below which the deposited film will be amorphous. Surface diffusion requires much less energy than diffusion through the bulk, so that these temperatures are often lower than those required to make amorphous films by ion implantation. It is difficult to make a distinction between truly amorphous solids and crystalline solids in which the crystal size is extremely small (less than two nanometers). Even amorphous materials have some short-range order among the atomic positions (over distances of less than five nanometers). Furthermore, in very small crystals, a large fraction of the atoms are located at or near the crystal's surface; relaxation of the surface and interfacial effects distort the atomic positions, decreasing the structural order. Even the most advanced structural characterization techniques, such as X-ray diffraction and transmission electron microscopy, have difficulty in distinguishing between amorphous and crystalline structures on these length scales. The transition from the liquid state to the glassy state, at a temperature below the equilibrium melting point of the material, is called the "glass transition." From a practical point of view, the glass transition temperature (Tg) is defined empirically as the temperature at which the viscosity of the liquid exceeds a certain value (commonly 1013 pascal-seconds). The transition temperature depends on cooling rate, with the glass transition occurring at higher temperatures for faster cooling rates. The precise nature of the glass transition is the subject of ongoing research. What is the nature of the phase transition between a fluid or regular solid and a glassy phase? What are the physical processes giving rise to the general properties of glasses? Christie, John. What is the difference between an amorphous solid and a non-Newtonian fluid?" School of Physical Chemistry, La Trobe University, Bundoora, Victoria, Australia, 1997. Retrieved November 21, 2007. Neumann, Florin. 1996. "Glass: Liquid or Solid—Science vs. an Urban Legend" Retrieved November 21, 2007. This page was last modified on 17 November 2016, at 16:22.